It was the backstage pass that got Michael in. Here was his once in a lifetime chance to meet the man who had made it to the top. The one who held a position of honor that others had only dreamed about. This celebrity had it all it seemed. The fame, the recognition, the awards. And Michael was just inches from him – a foot away from whom many considered to be an icon of the silver screen. Others would ask for an autograph, a photo maybe or a “leg up” in a highly competitive field. But Michael, a Christian, decided to change things up a bit and used the opportunity to do something that I’m guessing was pretty unique. When it was his turn to speak to the famous man, Michael simply asked him how he could pray. Pen in hand, the man looked up at Michael a bit incredulously at first. Surprised, I think, at the question. It took a few more seconds before the famous man could switch gears. He was used to people wanting things from him, I’m guessing. Not asking how they could serve him. When Michael told me that story, I had to smile inside. You see, before he left for the event. I had prayed that he would the have the opportunity to tell the famous man about Jesus. And you know what? Michael did something even better. He showed him Jesus. I had a pastor once who talked about using prayer as a witnessing tool. He said that one of the best ways you could communicate your faith to someone is to pray for their needs. Praying is very relatable. It shows you care about the person and that you believe in a God who can answer that prayer. My mother-in-law was born and raised in Cuba. She moved to the U.S. in the early 60s with most of her family. And, even though she’s lived in Spanish-speaking communities most of her life, she has taken great strides in learning English. But since I don’t speak Spanish, there are still some communication barriers between the two of us. Sometimes, I wish I could really talk to her about God in a way that she would understand. But somehow I always seem to come up failing. One thing though, that she lets me do from time to time -- is pray for her. When she mentions a need, I’ll ask permission to do it first – even if we’re on the phone – and then I’ll let loose appealing to God for her need. I know that some of my words she may not catch. But I also know that my faith is communicated clearly. And I’m thinking that through prayer – we’re speaking the same language. I like what Pastor Mohr says about praying “in the presence of others.” Long ago, I learned the benefits of “right now” prayer. And I think it sometimes surprises people when I engage in this. Too many times we tell people in passing that we’ll pray for them without actually backing it up with action. If the timing is right, I say – go ahead and do it. Right then and right there. Praying for the unbeliever’s needs can help melt that crusty part in their heart that’s hardened towards God. There’s a softening that can happen and sometimes -- an open door. You see, Michael could have approached his backstage opportunity from a different angle. When it was his turn to talk to the famous man, he could have hit him over the head with his Bible. Or, he could have brought up things in his work that might not have been pleasing to God. “You’ve got me right?” he asked. “Yeah, I’ve got you.” Michael replied. 14 Are any sick? They should call the elders of your church and ask them to pray. They will gather around and anoint them with oil in the name of the Lord. 15 Prayers offered in faith will restore them from sickness and bring them to health. The Lord will lift them up from the floor of despair; and if the sickness is due to sin, then God will forgive their sins. 16 So own up to your sins to one another and pray for one another. In the end, you may be healed. 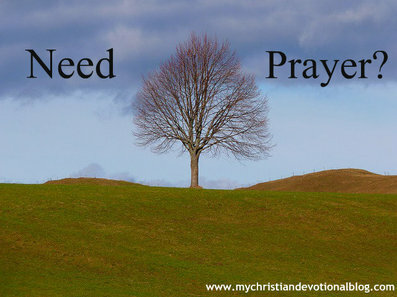 Your prayers are powerful when they are rooted in a righteous life.